It's the biggest game on the planet, with (probably) the biggest following to boot. 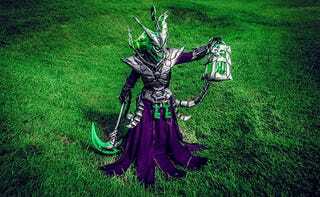 So yeah, there are people all over the world dressing up as League of Legends characters, and they are doing a damn fine job of it. This gallery collects some of the best examples of League of Legends cosplay from across the planet. Some of it is current, some of it is years old, all of it is excellent. If you've got a particular favourite that you think I've missed or overlooked, let me know! Cosplay by Missyeru, photo by cwajbaum. Cosplay by Junkers, photo by Anna Fischer. Cosplay by Akaiatana, photo by Kevin Chan. Cosplay by Yaya Han, photo by N8e. Cosplay by Shappi, photo by Kwak. Cosplay by NereideCosplay, photo by Pika Shoot. Cosplay by Calssara, photo by Midgard1612. Cosplay by Jynx, photo by Jeprox. Cosplay by ConJurer, photo by Mezame. Cosplay by Shinrajunkie, photo by SFDesign21. Cosplay by Missyeru, photo by Martin Wong. Cosplay by Elffi, photo by Fernando Brischetto for Photographes Sans Frontieres. Cosplay by Kimchi4U, photo by Phant. Cosplay by Leeki Cosplay, NereideCosplay, Sköll Cosplay, photo by studiosushi. Cosplay by Yoshplay, photo by Nils Katla. Cosplay by Danielle Beaulieu, photo by Elysiam. Cosplay by 18Fly, photo by Julien Rico Photographe.